A wrongful death lawsuit filed by the family of Rebecca Zahau will head to trial, a judge ruled Friday afternoon. Judge Katherine Bacal set trial for March 10, 2017. 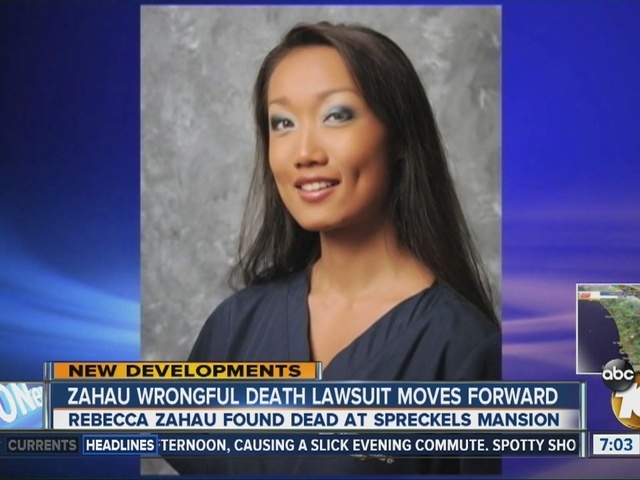 On July 13, 2011, 32-year-old Rebecca Zahau was found naked and hanging from the second-story balcony of the Spreckels Mansion in Coronado. Two days prior, on July 11, Max Shacknai, the six-year-old son of Zahau's millionaire boyfriend Jonah Shacknai, fell down some stairs. He died three days later in what was considered a freak accident. At the time, he was under Zahau's care. After a months-long investigation, the San Diego County Medical Examiner and San Diego County Sheriff's Department ruled Zahau's death a suicide. Zahau was found with her hands and feet bound behind her back with red rope. Her mouth had been gagged. Investigators said she then hopped over a balcony and hung herself. But Zahau's family refuses to believe she took her own life. They hired attorney Keith Greer to prove she was murdered. Greer believes that Adam Shacknai, Dina Shacknai and Nina Romano were behind Zahau's death . Adam is Jonah Shacknai's brother. Jonah is a wealthy Arizona businessman who was dating Rebecca. Dina is Jonah's ex-wife. Nina is Dina's twin sister. Max was Jonah and Dina's son. In July 2013, Zahau's family filed a $10 million wrongful death lawsuit in federal court against Dina. Also named in the lawsuit were Nina and Adam. Jonah was not named. Greer alleges their motive for killing Shacknai was revenge for the accident in the mansion that killed Max, on Rebecca's watch. Greer believes that Rebecca was strangled to death before she went over the balcony. On Thursday, 10News learned the three defendants requested to have the case dismissed, but that request was denied by the judge.